Community supported agriculture (CSA) is becoming more and more popular as people want to know exactly where their produce, meat, and dairy are coming from. As a CSA farmer, you have the ability to capitalize on this demographic of food-conscious people to grow your business, but you also need to ensure the local community are coming to you and not to your competition. Below, you’ll find five ways to make your CSA stand out from the competition — and we don’t just mean other CSAs in the area. Grocery stores and meal delivery programs are all offering something similar: produce and convenience. You simply need to prove to your shareholders that your produce is fresher, better, and more convenient than what the “other guys” are offering. Keep reading to learn a few ways to get ahead of the competition! Offer Home Delivery Of Fresh Produce: As a CSA farmer, you have a lot of competition whether there are other CSAs in your region or not. Home delivery of fresh produce looks to be the way of the future, with everyone from local and national grocery chains to Walmart and Amazon offering grocery deliveries. On top of that, you also have companies like Blue Apron and Hello Fresh delivering full meal kits. It is worth adding the convenience of home delivery to your CSA, as potential customers might be on the fence if they will need to travel to your farm to get their produce. Advertising your home delivery capabilities might just be what it takes to convince them to use your service. After all, produce they get from a CSA is going to be fresher and closer to home than anything they can get from Amazon or Blue Apron! And if this sounds complicated, don’t worry. There is software for local farmers that make the ordering, routing, and delivery process seamless. Create An Online Community: Consider starting a Facebook group or other online forum where members of your CSA can interact with each other, share recipes, and discuss other topics related to your farm. This is also a great place for you to share updates about the farm and get your shareholders more involved. Share pictures of upcoming yields to get customers excited about their next delivery or let them know the best way to store this week’s items to keep them fresh. You can even offer opportunities for shareholders to come help out on the farm in exchange for discounts on their membership, or encourage them to invite their friends to the group so you can expand your reach to more potential customers. Get Certified: The more certifications you have as a local farmer, the more credibility you’ll have with your customers. If you grow organically or have free-range chickens, start the process of certification for it. You can also be certified in humanely raised meat products, grass-fed beef, non-GMO, and lots of other things that shareholders like to see! Sometimes the certification process can take a long time, but the sooner you start, the sooner you’ll be able to tell your shareholders you are an organic farmer, you’re just waiting on the paperwork. Offer Unique Produce… But Don’t Get Too Crazy: You want to offer your subscribers something special that other CSAs do not. However, you don’t want to get too crazy with how much unique produce you offer because your customers don’t want to have to Google every new vegetable they unbox as they are trying to cook dinner for their families. If you do offer some unique produce, be sure to include a recipe card on how to prepare and cook it. While most people will know exactly what to do with a crown of broccoli or some fresh carrots, they might be less sure how to prepare eggplant, jicama, and okra. Finding the perfect balance between variety, usability, familiarity, and uniqueness is key. Get Feedback From Your Shareholders: Perhaps one of the best things you can do for your CSA is continue to adapt and change it to meet the desires of your shareholders. For example, doing this can relate directly back to number four by allowing your customers a place to say, “Hey, there’s way too many radishes in here and we never eat them!” Or, you might find that they love how much variety you have and that you’re the best CSA farmer they’ve ever worked with. If you never seek feedback, you’ll never know how they feel. One way to do this is by emailing surveys to your customers. Doing this at least twice throughout the season is a great place to start. Send out a survey in the middle of the season and ask your customers about their overall satisfaction and what they would like to see change. 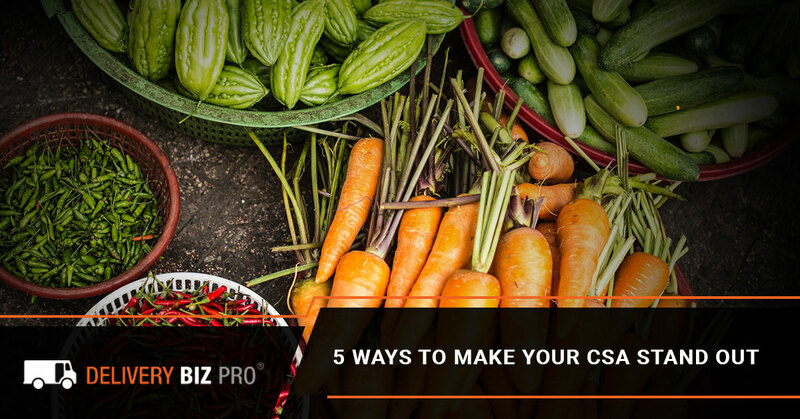 If you find out that a majority of your customers are unhappy about a certain aspect of your CSA, you’ll have time to make changes before the end of the season and hopefully encourage them to renew their membership. Using a software for small farmers will make it easier to keep up communication. Want To Learn More About Our CSA Software? Let's Chat! Let’s Deliver The Groceries, Together! We know that transitioning from a traditional pick-up-at-the-farm CSA to a CSA that offers delivery services is a huge step. There are a lot of factors that go into it, but we want to make it easy for you. Our comprehensive software has been specifically designed to meet the needs of local farmers who offer delivery services of their fresh produce. With features ranging from inventory management to mass customer communication to routing your entire customer base with the press of a button, we make it easy to handle orders and get them delivered to the right people at the right time. Get in touch with Delivery Biz Pro today to learn more about using our produce delivery software for your CSA farm! We’ll set up a time to chat and see if we’re the right choice for your business.